At the very least, you’re probably misinterpreting what it’s saying. People’s attitudes toward GPS devices are very interesting. Since 2000, when selective availability was turned off, GPS has become ubiquitous to the point where most people have one and interact with it on a daily basis, whether they know it or not. To make things even more confusing, the general case of global positioning, whether satellite based or not, is completely pervasive. You may not know this, but this web site knows where you are (to some level of detail) right now. At the same time, the general understanding of how GPS works and it’s level of accuracy has gotten worse. This is a natural consequence of ubiquity; as more people use these devices, the average level of expertise diminishes. However, we should expect outdoor professionals to have a much clearer and nuanced understanding of GPS and it’s accuracy, shouldn’t we? How accurate do you think your GPS unit is? Do you own or regularly use a GPS? What kind of GPS do you own? Do you know how to read the accuracy of your GPS? To your understanding, what does it mean when your GPS unit displays an accuracy reading of 5m? This is a very unscientific survey due to the limited size of the sample and the nature of the distribution. There is certainly a self-selection process at work. Tellingly however, the self selection should have been toward those more more knowledge of GPS, and not less. However, I suspected that even expert users didn’t know how accurate their GPS was, and this survey was designed to test that knowledge. 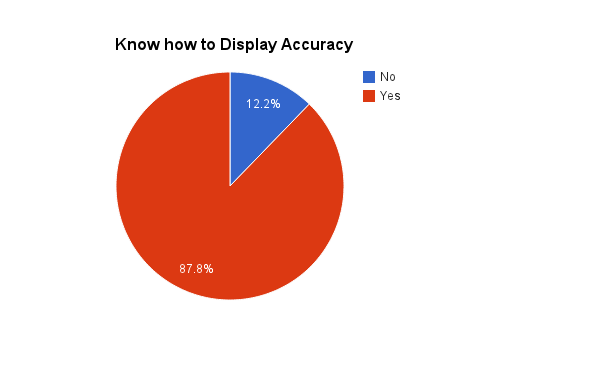 I present the results here to illustrate that a small sample of expert GPS users don’t know what the accuracy displayed on the GPS means, but with the intent to show that those displays are actually quite misleading. 7 respondents didn’t own or regularly use a GPS so their results were thrown out; I wanted to survey regular users or owners. Surveyed GPS type for users. 88% of respondents knew how to display the accuracy of the GPS. Very good. 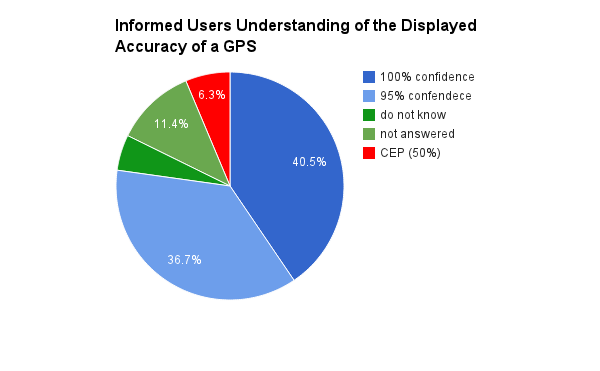 Percent of users who know how to read or display the current accuracy of their GPS unit. Note that it just says “GPS” and “4m” below that. On most GPS units that’s all you’re going to get. This level of accuracy is pretty standard for a purpose-built wilderness GPS unit on any given day that you’re in the open. The GPS is accurate to within 5 meters of the actual position. This answer seems right and makes the implicit assumption that the GPS is 100% certain that the actual position is within 5 meters of it’s calculated position. This is wrong. This answers explicitly states a 95% confidence interval, and is also wrong. The actual position is about 5 meters away from you. This is the correct answer and I will explain more about why later. The results are presented below. I interpreted responses to mean a 100% confidence interval (that the GPS is displaying a value that it is 100% confident that the displayed position is within 5 m of the real positions), a 95% confidence interval (the displayed position is within 5m of the real position 95% of the time), a “do not know” and a “not answered” category, and finally the correct answer; 50% confidence interval. Only 6.3% of respondents, or 5 people, knew the correct answer. The first thing to understand is that a GPS is solving some very complex equations. It really and truly does not know where on the surface of the planet it is, so the expression of how far it is from an actual position is derived from known errors in various parts of its derivation. We can call each “solution” to the position problem a measurement. As a result of the error present in various parts of the equations used in the measurement, a GPS can never say with 100% confidence that measurement is accurate, it can only express a confidence interval. The interval is usually expressed as a percent, meaning the proportion of measurements that are within a certain distance of the actual value. If you put a GPS in one place and record the measurements over a period of 24 hours you will get a plot of the position offsets from the mean value that looks like this. The “CEP” ring encompasses 50% of measurements, representing a 50% confidence interval. The 96% ring is the 2DRMS (Root Mean Square in 2D), and 96% of the measurements are in that ring. 50% of measurements will be larger than the CEP ring. and 7% will be 2-3 times larger. The results of the survey indicate to me that even expert users, such as SAR volunteers and outdoor professionals, enthusiasts, helicopter pilots, etc, do not know what the number displayed as the accuracy of their GPS means. Further, while attempting to read the manual for the GPS that I own, I did not find a good explanation for GPS accuracy, other than some “statements of conformity” that declare that a device meets certain standards. My feeling is that the device manufacturers benefit from displaying a lower number, leading people to believe a higher level of accuracy. I’ll be writing more about this in the future, but here’s what you can take home right now. You can safely take the accuracy of a GPS and double it to make your assumptions match with reality. van Diggelen, F. (2007). GNSS accuracy – lies, damn lies and statistics. 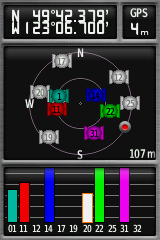 GPS World, 18(1). 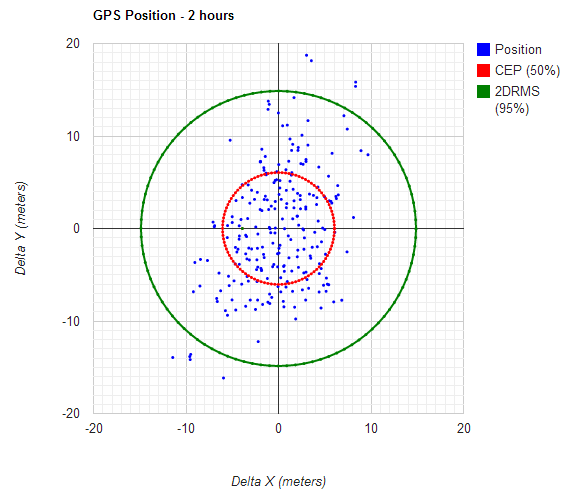 I am not sure I get it… Isn’t the graph “GPS positions over 24 hours” show that the GPS was accurate within 4.06m 98% of the time? How do you equate that with the correct answer being within 5m 50% of the time?? I see I’ve managed to confuse the issue quite a bit. The GPS that the chart represents would be displaying 1.67m as the accuracy measure. It’s probably a survey GPS and is more accurate than a commercial wilderness GPS. The 5m example was from a common accuracy measure I see on my Garmin GPSMap 62st when I am using it. There’s also the screen shot of that GPS which shows 4m accuracy. It’s still correct to say that if the GPS is showing “N” as accuracy, you should double it to give you the 98% confidence interval. 6 Pings/Trackbacks for "Your GPS is lying to you"